With over 30 years of legal experience and extensive background in a broad range of cases, it is likely that we have negotiated/litigated several cases that deal with your legal matter. 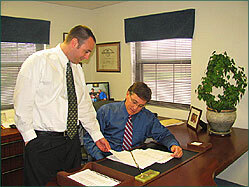 As attorneys, we practice throughout Rhode Island state courts including District Court, Superior Court and in the RI Supreme Court. By providing professional services, we look to develop a strong partnership with our diverse client base of individuals, expanding corporations, and entrepreneurial businesses. We enjoy a strong client following throughout Newport County - from Tiverton to Portsmouth, Middletown, Newport and Jamestown. The lawyers at the Law Office of David Fox offer experience, excellence, attention to legal detail and strong relationships throughout the Rhode Island legal system, to ensure that our work meets or exceeds clients' expectations. Our offices are conveniently located minutes from the Newport Courthouse in the Middletown Commons at 850 Aquidneck Avenue (Rte 138A), Middletown, RI - offering easy and ample parking steps from our office.